Saint-Saëns' favourite pupil, Gabriel Fauré, wrote in his obituary of his teacher of the ‘serene regions’ his music often inhabited, ‘where violence and paroxysms are unknown, where gravity, wit, charm and smiling tenderness rule side by side.’ In this he was echoing his teacher’s own response to the world around him: ‘Are smiles and graces to be ignored by all?... Happiness is disapproved of in the music of our time... Long live sadness! Long live boredom!’ To which I respond, ‘Long live keys, tunes, clarity and playfulness! Long live the music of Camille le Grand!’ Roger Nichols. 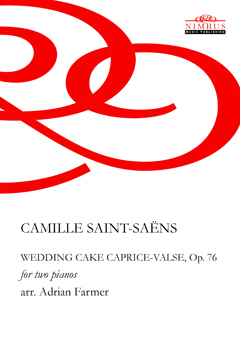 This recording is the first of two volumes of original compositions and arrangements for piano duo and duet by Camille Saint-Saëns. This programme presents the substantial Scherzo, Op. 87 and Polonaise, Op. 77 for two pianos alongside a number of smaller works for two pianos and piano four hands.